Like many companies, we’re often asked whether we’ll take on interns or people for work experience. Because of the way our company is set up, that’s really difficult – we all work remotely on a variety of different projects every day, many of them top secret. Involving interns in our conference calls with clients would be tricky, too. But we do want to be able to give something back to the community, and we really want to encourage young writers, as there’s no real career path to becoming a games writer. What’d really help people get a leg up in the industry? Well, employment, obviously – but failing that, a good portfolio with some properly polished interactive samples in it. That’s critical to getting your first writing gig. So that’s what we’re proposing to help out with in our mentorship programme! 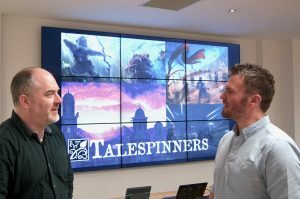 An opportunity to have mentorship from us, the writers and designers at Talespinners, to help you create a great piece of game writing. We have 4 places at any one time for this rolling programme. You’ll pitch us a proposal for a standalone project. If we offer you a place, we’ll work with you to mentor you through the creation of that project. We’ll help you plan it, set deadlines for delivery, offer advice, and review it and give you feedback at critical stages. By the time we’re done with you, you should have a polished piece of interactive storytelling that you can use for a portfolio piece. Or even to release commercially, should you wish to. We currently have 0 mentorship spaces open. We’ll make an announcement as soon as more spaces are available. What sort of project can I pitch? The project must contain story and interactivity. It should be achievable in whatever spare time you’ve got in less than a year. It shouldn’t have a heavy tech requirement, or a heavy asset requirement. We want to focus on the story, not on frames per second or shader code. It should be a fresh project, not a reworking of something already in progress. It must not use someone else’s IP. 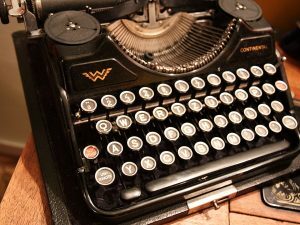 Ideal examples are interactive fiction using tools such as Twine, Ink, or Choicescript, although we’ll happily consider other proposals. No. Sorry. This isn’t like an internship – you’re not doing work for us. We’re doing consultancy work for you. For free. Does Talespinners own the IP? Absolutely not. It’s all yours, even the bits we’ve given you advice about. Won’t you steal my idea? No. We have hundreds of ideas. Our clients have hundreds of ideas. Why would we want someone else’s? And if you’re that worried about a particular idea, then should you be using it for a portfolio piece in the first place? Will you publish it for me? We’re not a publisher. But you never know, we might be able to point you at some possibilities. Do I have to be in the UK? Not at all, although your project does have to be in English. We want each project to be done, out, released and playable in under a year. You have to deliver. You have to hit deadlines, respond to our feedback, and actually make the thing. That’s 50% of any writing job, alongside the 25% for writing and the 25% for warm beverage drinking. If you don’t, we’ll wave you goodbye, and fill your place with another mentee. When should I expect a response to my application? That entirely depends how many applications we’re dealing with and how busy we are on paying projects. It may be a few weeks, depending on our workload. What’s in it for Talespinners? A warm, rosy glow, and perhaps the possibility of spotting up-and-coming young writers who we might one day invite to join us. But that’s by no means a certainty. At the worst, we hope to create a better class of rival. Writing is a lonely business, so having a network of duelling opponents and twisted nemeses with a thirst for revenge will make things more exciting, right? We’ll feature you on our website and link to your portfolio. Oh, and you’ll get to chat with our other mentees. When mentorship places are available, we’ll post details of how to apply on this page. Aside from being 16 or over (or even geriatric like some of us!) and fluent in English – you can be any gender, any size, shape, or colour, and we would like to encourage applications from people of backgrounds typically underrepresented in the industry.